Five Separate Scenarios PLUS Campaign Game PLUS Links to Other Games of the Series. Italy decides to enter the war. Once a member of the Triple Alliance with Germany and Austria-Hungary, Italy now sides with the Entente. Italy's dream is of annexing Austro-Hungarian territory inhabited by ethnic Italians. Austria-Hungary views Italy not only as traitorous, but also as its traditional enemy. The stage is set for a bloodbath. The Italian army attempts to cross a narrow path into Austria-Hungary, across the Isonzo River towards Trieste. There the Austro-Hungarian army is dug in and waiting for them. The Chief of Staff of the Austro Hungarian army, Conrad von Hotzendorff, feels the time is right to punish Italy. He ignores the German chief Falkenhayn who foresees problems on the Eastern Front. Conrad masses guns and men in the Tirol for a strike to cut off the Italian armies to the east along the Isonzo. The plan looks good on paper, but the attacks will take place across rugged country. The Italians in the southern Tirol have neglected their rear area defenses. Italian reinforcements rush to the area. It is a dicey affair, but the Italian lines hold fast. The peril to the Italian forces along the Isonzo is checked. Again and again and again, valiant Italian infantry has been fed into the maelstrom of the Isonzo. Each battle differs from the last only by their increasing intensity. The 9th Isonzo battle brought the capture of Gorizia. 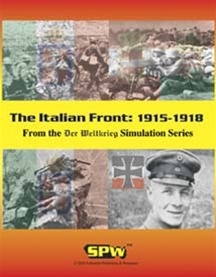 Now the Italians work to enlarge their holdings on the east of the bloody Isonzo. In the end, each side is once again exhausted. The Italians have become weary of the war. Yet, the Austrians feel that one more attack along the Isonzo may be the one that breaks their army first. With Russia just about finished, the German army turns to help its beleaguered ally. Crack German divisions are sent to the Italian front to remove the mortal threat to Austria-Hungary. The Austrians reinforce the front with specially trained assault units. The Italians along the headwaters of the Isonzo are overwhelmed. German and Austrian units pour through the mountain gaps and into the Italian rear. Italian units melt away in the rush to get out of the trap. The gains of the Isonzo battles are permanently lost. Enterprising Austrians cross the Tagliamento River. Further Italian retreats ensue. The rout of the Italians ends along the banks of the Piave, the last natural barrier before Venice and the open country of the Po Valley. But Italy is not defeated, and her citizens rally anew to the cause. The Germans are on the attack in France. Conrad wants in on the glory. Although the soldiers of the once proud Habsburg armies are weak and emaciated, they will have to go on the offensive one more time. As so often before, the Austrians split their strength between Conrad's armies in the Tirol and the forces along the Piave. Conrad's attacks from the north are ineffective. Once again the Marshal has made unrealistic plans his forces cannot execute. In the rugged mountain terrain only a single division manages to make any gains. Initial attacks across the Piave are successful, but quickly bog down. The Austrians have crossed the river, but cannot push far enough forward on the west bank to keep their pontoon bridges out of range of Italian artillery. 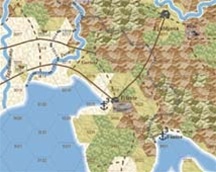 Unable to advance, and unable to maintain viable supply lines across the river, they cross back, only to await the end.